Emory joins the nation in honoring Martin Luther King Jr., shown here in 1964, with more than a week of events focused on community service and social justice. Public domain as part of the New York World-Telegram and the Sun Newspaper Photograph Collection (Library of Congress). 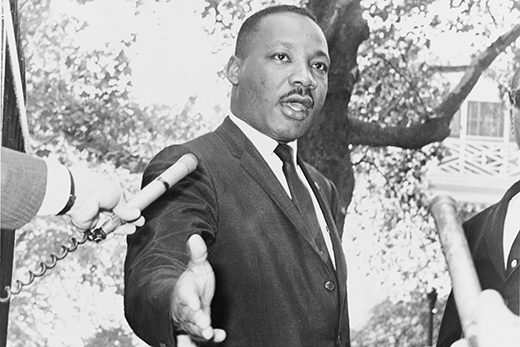 The life and legacy of Martin Luther King Jr. will be celebrated at Emory this month with a series of events rooted in ideals that the acclaimed American civil rights leader exemplified, including teaching, service and reflection. The Emory and Oxford College communities are invited to take part in an array of activities for Emory's observation of King Week, including special lectures, public discussions, service awards, musical performances worship services, and opportunities for community service. Beyond community engagement, the celebration offers a chance for everyone to consider how virtues such as compassion, humility, global vision and nonviolence might be woven into their daily lives, according to event sponsors. "While we are celebrating King Week at Emory to honor the legacy of Dr. King, we want to move the community beyond a day, week or month of celebrations," says Michael Shutt, interim director for Emory's Center for Diversity and Inclusion. "We aspire to be a community that applies Dr. King's legacy to every action and decision throughout the year, while holding Dr. Martin Luther King, Jr. Day as a moment of reflection and time of community accountability," he adds. Ifill is president and director-counsel of the NAACP Legal Defense and Educational Fund, and has also enjoyed a distinguished career as a litigator, constitutional law scholar and public intellectual. A frequent commentator on Sunday morning talk shows, she has litigated landmark voting rights cases and authored the critically acclaimed "On the Courthouse Lawn: Confronting the Legacy of Lynching in the 21st Century," which discusses the continuing legacy of Jim Crow-era lynchings on communities today. Sponsored by Emory School of Law, this event is free and open to the public, followed by a reception in Hunter Atrium. An ordained elder in the United Methodist Church, Lawrence has served as a preacher, a teacher and a church leader. A native of Orangeburg, South Carolina, she accepted her call to ministry following a 10-year career in fashion and corporate retail. Today she is an advocate for youth development as the impetus for long-term social change. Lawrence recently lived in Ghana, West Africa, where she researched rites of passage for young people. Volunteer Emory, a part of the Office of Student Leadership and Service, invites the entire community to make the MLK holiday a "day on" rather than a "day off." This year, Emory's "Day On" will engage more than 400 Emory students in community service projects across Atlanta. Volunteers may check in at 11:30 a.m. at the Coca-Cola Commons in the Dobbs University Center. Service projects will run from 1 to 3 p.m.. Those interested in volunteering may register from Jan. 8-15. To honor King's legacy, Volunteer Oxford will engage students, faculty and staff in local collaborative projects. Check-in will be from 8:30-9 a.m. in Williams Auditorium. Service projects around the community will run from 10 a.m. to 1 p.m. Online registration will be emailed to the Oxford community; registration is open through Jan. 15. Jealous, a former NAACP president and noted civil and human rights advocate, will present Emory's annual MLK Lecture. An NAACP leader who helped move the organization into the digital age, Jealous has fought for voting rights, for marriage equality, to free those wrongly incarcerated, to end the abuse of prison inmates, and to stop racial profiling by law enforcement officials. His talk, "That One Big Thing," draws upon the leadership tradition that connects Nelson Mandela, Martin Luther King, Jr., Shirley Chisholm, Frederick Douglass, Cesar Chavez, and Frances Willard, challenging young people to define how they will each change the world. Drawing upon his own work, he offers simple steps toward achieving feats of great social transformation and service. Join in a critical discussion about current representations of King, whether in movies or history textbooks, whether those portrayals align with the Civil Rights Movement as a whole, and how that impacts today's social movements. The event will begin with a brief introduction followed by a debate led by representatives from the Barkley Forum, Emory's award-winning debate program, and conclude with a group discussion. Candler School of Theology's bishop-in-residence, Woodie W. White, will present thoughts on the state of race relations in his annual "Letter to Martin Luther King Jr.” Every January, White writes a “birthday letter” to King describing the progress and pitfalls in race relations during the previous year. White, who met King in the early 1960s, wrote his first letter to the civil rights icon in 1976 for a public speaking engagement, and began the annual practice in 1985. The letters are published each year by United Methodist News Service. You can also livestream the event. For more than 23 years, the Rollins School of Public Health and the Goizueta Business School have honored the legacy of King through the Martin Luther King, Jr. Community Service Awards Program, which celebrates the contributions of individuals and organizations whose tireless service to Atlanta's communities exemplifies the work of King. The Rev. Francys Johnson, Georgia State NAACP president, will be the featured speaker. AHANA A Capella will perform at the event, along with spoken word artist Paula Fontana. Emory's Voices of Inner Strength will present a gospel music concert to showcase the music that inspired King and strengthened his faith. Music about faith, hope and love will be highlighted at this concert, which is free and open to the public. Experience Shuttles to the National Center for Civil and Human Rights, 10:30 a.m. to 5 p.m.
Shuttles are available to the National Center for Civil and Human Rights. Tickets are available, but limited. Those interested may register online beginning Monday, Jan. 11. The King Week University Worship Service will be presented by James Waits, dean of Candler School of Theology from 1978 to 1991 and professor emeritus of practical theology. Waits served as a Methodist minister in Mississippi in the 1960s and was a member of the Committee of Southern Churchmen. In 1963, he was among a group of 28 white ministers to sign "Born of Conviction," a statement supporting integrated schools and freedom of the pulpit. While dean of the School of Theology, he also served as the first director of The Carter Center. The service will celebrate the life and legacy of King through word, song and prayer. Special music will be provided by Voices of Inner Strength Gospel Choir. A free lunch will follow in Brooks Commons. Matthew Williams, vice president of strategic initiatives at the Forum for Theological Exploration, will present the keynote. The evening will also include performances by Interdenominational Community Choir and Oxappella. For more information about Emory's King Week events, visit www.facebook.com/eukingweek.